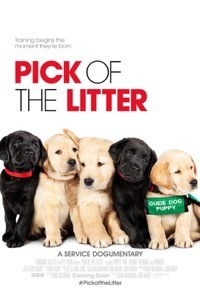 PICK OF THE LITTER follows a litter of puppies from the moment they're born and begin their quest to become guide dogs for the blind. Cameras follow these pups through an intense two-year odyssey as they train to become dogs whose ultimate responsibility is to protect their blind partners from harm. All the fluffy adorableness audiences expect from a puppy documentary, along with a story that's as edifying as it is heartwarming. 100% on Rotten Tomatoes!